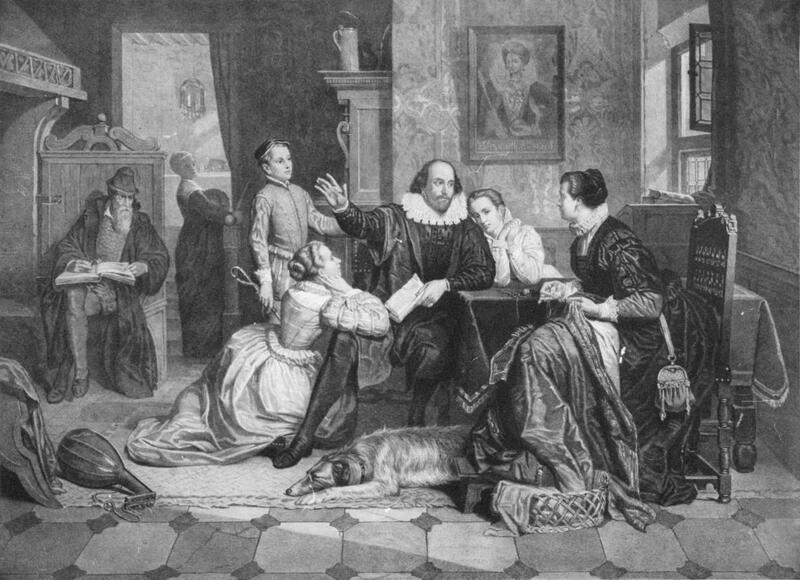 On this date in 1585, fraternal twins, Hamnet and Judith, born to William Shakespeare and Anne Hathaway, were baptized. Their date of birth (as with Shakespeare), is not recorded. They were probably born in the same house where their father was born, and certainly raised there. They were probably named after Hamnet Sadler, a baker, who witnessed Shakespeare’s will, and his wife, Judith. According to the record of Sadler’s baptism on 23rd March 1560 in the Register of Solihull he was christened Hamlette Sadler, which has caused some idle speculation among literary historians concerning Shakespeare’s play Hamlet, and his son’s name – the kind of musing that occupies doctoral candidates with nothing better to do with their time. By the time the twins were four, their father was already a London playwright and, as his popularity grew, he was probably not regularly at home in Stratford with his family. Hamnet may have completed Lower School, which would have been normal, before his death at the age of eleven (possibly from the bubonic plague). He was buried in Stratford on 11th August 1596. At that time in England about a third of all children died before age 10. Judith Shakespeare was almost certainly illiterate. In 1611, she witnessed the deed of sale of a house for £131 to William Mountford, a wheelwright of Stratford, from Elizabeth Quiney, her future mother-in-law, and Elizabeth’s eldest son Adrian. Judith signed twice with a mark instead of her name. 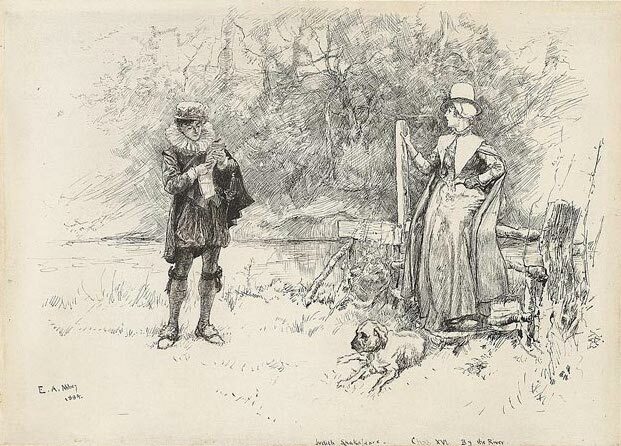 On 10th February 1616, Judith Shakespeare married Thomas Quiney, a vintner of Stratford, in Holy Trinity Church. The assistant vicar, Richard Watts, who later married Quiney’s sister Mary, probably officiated. The wedding took place during the pre-Lenten season of Shrovetide, which was not a lawful time for marriages. In 1616, the period in which marriages were banned without dispensation from the church, including Ash Wednesday and Lent, started on 23rd January, Septuagesima Sunday and ended on 7th April, the Sunday after Easter. Hence the marriage required a special license issued by the Bishop of Worcester, which the couple had failed to obtain. Presumably they had posted the required banns in church, but this was not considered sufficient. The infraction was a minor one apparently caused by the minister, as three other couples were also wed that February. Quiney was nevertheless summoned by Walter Nixon to appear before the Consistory court in Worcester. (This same Walter Nixon was later involved in a Star Chamber case and was found guilty of forging signatures and taking bribes). Quiney failed to appear by the required date. The register recorded the judgement, which was excommunication, on or about 12th March 1616. It is unknown if Judith was also excommunicated, but in any case the punishment did not last long. In November of the same year they were back in church for the baptism of their firstborn child. The marriage did not begin well. Quiney had recently got another woman pregnant, Margaret Wheeler, who died in childbirth along with her child. Both were buried on 15th March 1616. On 26th March, Quiney appeared before the Bawdy Court, which dealt, among other things, with “whoredom and uncleanliness.” Confessing in open court to “carnal copulation” with Margaret Wheeler, he submitted himself for correction and was sentenced to open penance in a white sheet (according to custom) before the Congregation on three Sundays. He also had to admit to his crime, this time wearing ordinary clothes, before the Minister of Bishopton in Warwickshire. The first part of the sentence was remitted, essentially letting him off with a five-shilling fine to be given to the parish’s poor. As Bishopton had no church, but only a chapel, he was spared any public humiliation. Where the Quineys lived after their marriage is unknown: but Judith owned her father’s cottage on Chapel Lane, Stratford; while Thomas had held, since 1611, the lease on a tavern called “Atwood’s” on High Street. The cottage later passed from Judith to her sister as part of the settlement in their father’s will. In July 1616 Thomas swapped houses with his brother-in-law, William Chandler, moving his vintner’s shop to the upper half of a house at the corner of High Street and Bridge Street. This house was known as “The Cage” and is the house traditionally associated with Judith Quiney. In the 20th century The Cage was for a time a Wimpy Bar before being turned into the Stratford Information Office. The Cage provides further insight into why Shakespeare would not have trusted Judith’s husband. 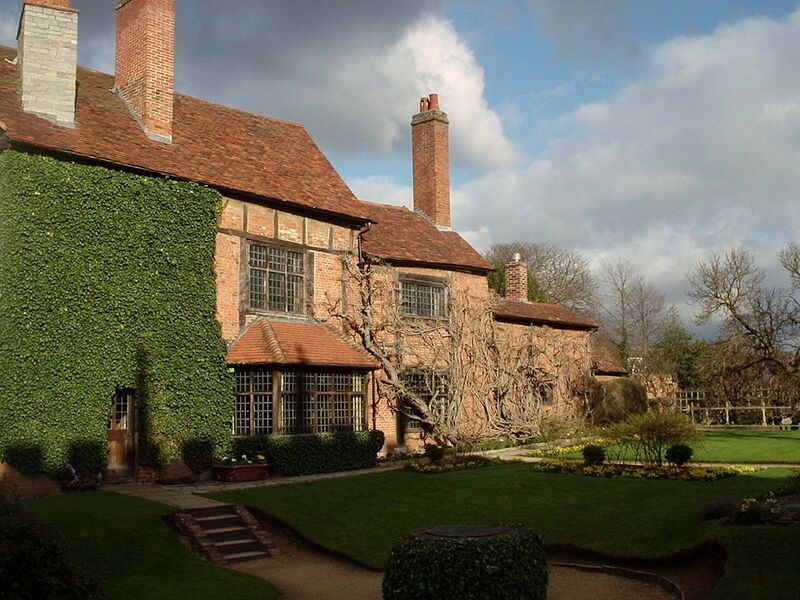 Around 1630 Quiney tried to sell the lease on the house but was prevented by his kin. In 1633, to protect the interests of Judith and the children, the lease was signed over to the trust of John Hall, Susanna Shakespeare’s husband (Judith’s brother-in-law), Thomas Nash, the husband of Judith’s niece, and Richard Watts, vicar of nearby Harbury, who was Quiney’s brother-in-law and who had officiated at Thomas and Judith’s wedding. Eventually, in November 1652, the lease to The Cage ended up in the hands of Thomas’ eldest brother, Richard Quiney, a grocer in London. 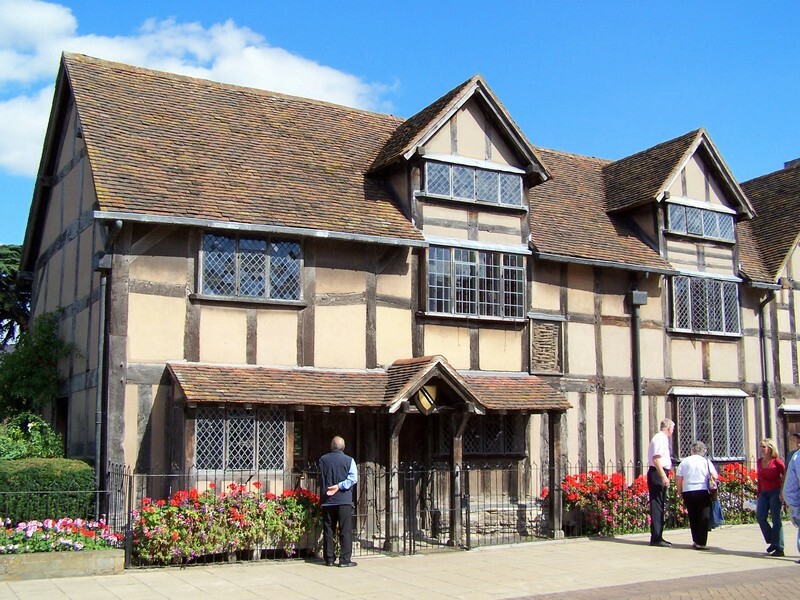 Finally, for the bulk of his estate, which included his main house, New Place, his two houses on Henley Street and various lands in and around Stratford, Shakespeare had set up an entail. His estate was bequeathed, in descending order of choice, to the following: 1) his daughter, Susanna Hall; 2) upon Susanna’s death, “to the first sonne of her bodie lawfullie yssueing & to the heires Males of the bodie of the saied first Sonne lawfullie yssueing”; 3) to Susanna’s second son and his male heirs; 4) to Susanna’s third son and his male heirs; 5) to Susanna’s “ffourth … ffyfth sixte & Seaventh sonnes” and their male heirs; 6) to Elizabeth Hall, Susanna and John Hall’s firstborn, and her male heirs; 7) to Judith and her male heirs; or 8) to whatever heirs the law would normally recognize. This elaborate entail is usually taken to indicate that Thomas Quiney was not to be entrusted with Shakespeare’s inheritance, although some have speculated that it might simply indicate that Susanna was the favored child. Shakespeare was named for his grandfather. Richard’s name was common among the Quineys: his paternal grandfather and an uncle were named Richard. Shakespeare Quiney died at six months of age. Richard and Thomas Quiney were buried within one month of each other, 21 and 19 years old respectively. The deaths of all of Judith’s children resulted in new legal consequences. The entail on her father’s inheritance led Susanna, along with her daughter and son-in-law, to make a settlement using a rather elaborate legal device for the inheritance of her own branch of the family. Legal wrangling continued for another thirteen years, until 1652. Judith Quiney died before 9th February 1662 (the day of her burial and a week after her 77th birthday). She outlived her last surviving child by 23 years. She was buried in the grounds of Holy Trinity Church, but the exact location of her grave is unknown. Of her husband, the records show little of his later years. 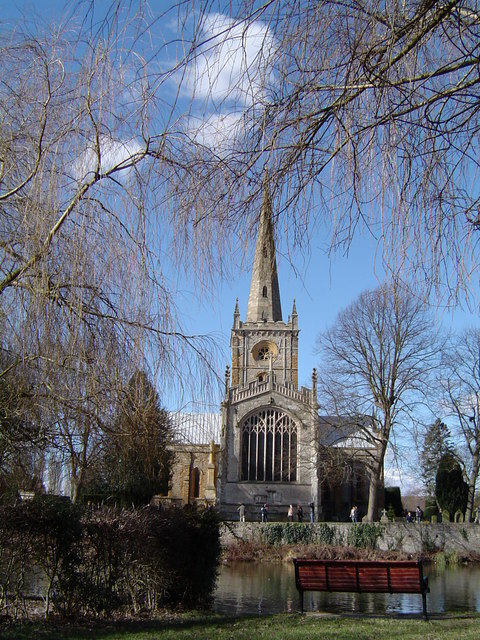 It has been speculated that he may have died in 1662 or 1663, when the parish burial records are incomplete, or that he may have left Stratford-upon-Avon. Take either of these, and lard it with Lard, and stick it thick with Rosemary, then rost it with a quick fire, but do not lay it too near; baste it with sweet butter: then take half a Pint of Claret wine, a little beaten Cinamon and Ginger, and as much sugar as will sweeten it, five or six whole Cloves, a little grated bread, and when it is boiled enough, put in a little Sweet butter, a little Vinegar, and a very little Salt, when your meat is rosted, serve it in with Sauce, and strew salt about your Dish. My idea would be to start with ground or finely chopped venison. Brown it in a little oil with some chopped onions and chopped bacon, then add red wine and beef stock plus rosemary, cinnamon, ginger, and cloves, and simmer for several hours. You could also add red currants or pitted prunes. When the sauce has reduced, add breadcrumbs to thicken. 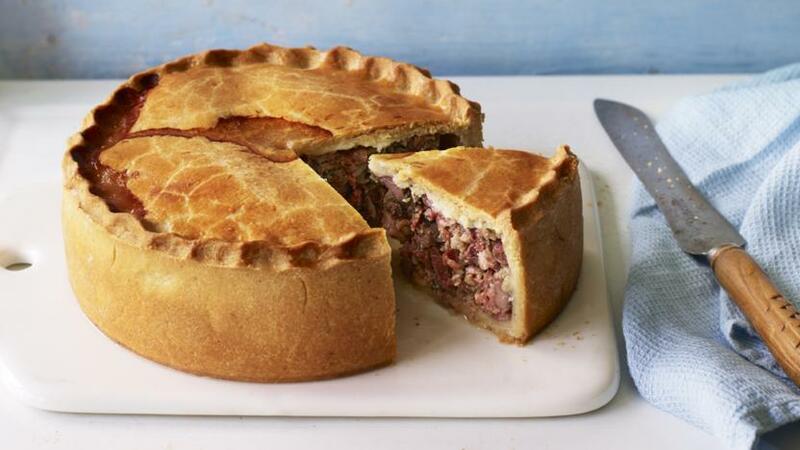 Line a deep pastry dish with hot water pastry, fill with the meat mixture, cover with a pastry lid, and bake until golden. Could be served hot or cold.